We get it! The scheduling problems faced by volunteer coordinators at Meals on Wheels and other similar volunteer-driven organizations are unique... We can help! 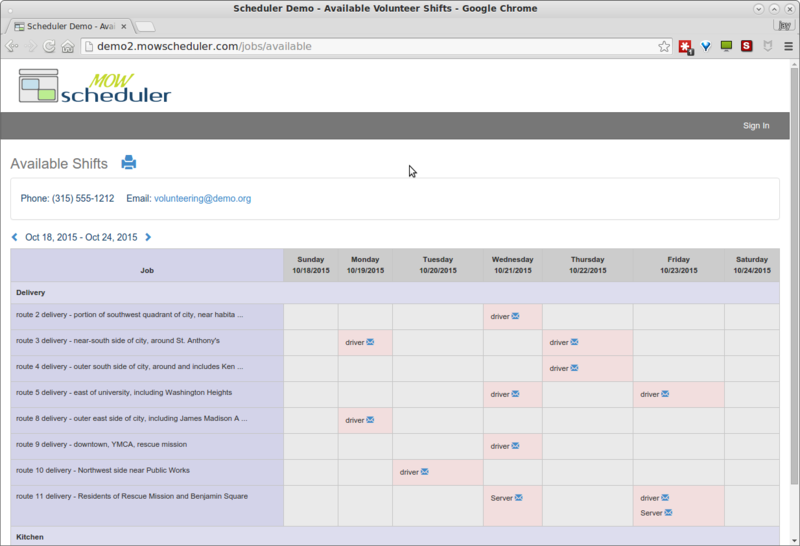 MOW Scheduler was designed from the ground up to meet the unique needs of volunteer coordinators who manage a large number of recurring shifts. Match the right volunteer to the right job... get more done and increase volunteer satisfaction. Wouldn't you like to have ready answers to questions like these? Are we fully staffed for Wednesday's kitchen jobs? How could we best use Sally next Tuesday? Who should we call to fill in as a server on Route 3 on Thursday morning? How many miles did John drive last year? Joe's phone seems to be off, how else can I reach him? Did Mary show up for her shift yet? 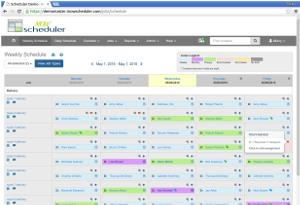 Would you like someone to walk you through MOW Scheduler's functions and answer questions you might have? Give us a shout and we'll hook you up with a web demo! 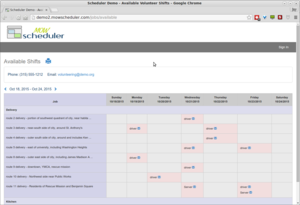 The Scheduler includes the features needed by volunteer coordinators to manage their day-to-day operations, as well as providing a "big picture" overview of the volunteer activities. Access your system from anywhere, on any device. You don't need any special software, hardware, or other infrastructure to ensure that your system and data is safe, secure, reliable, fast, and easy to use. We'll take care of it! 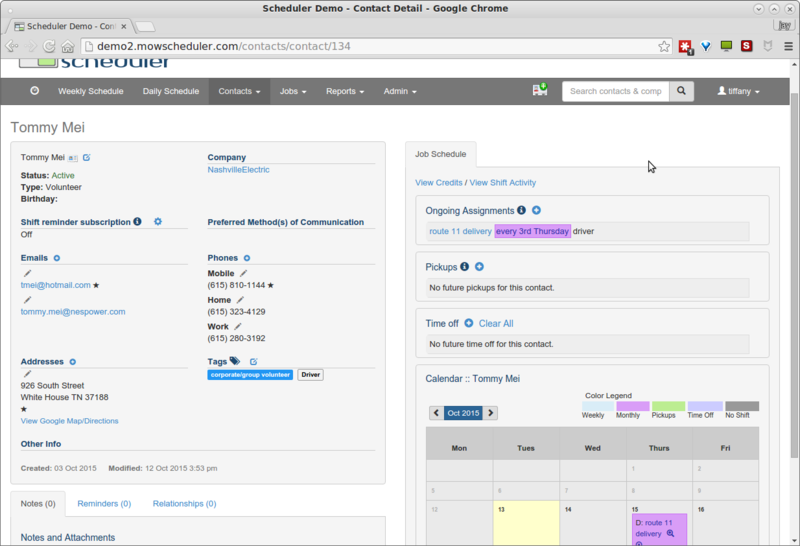 Schedule volunteers for automatically recurring weekly or monthly commitments, or one-time ad-hoc assignments. Automatically send configurable reminders of upcoming shifts to volunteers by email or SMS text, to significantly reduce the number of "no shows". Simple but powerful contact database makes it easy to keep and find all the information you need about your volunteers. 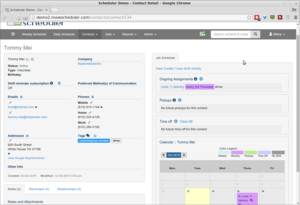 Includes a powerful search interface, volunteer activities history, upcoming commitments and scheduled time off, notes, and attached documents, photos, etc. See at a glance which future shifts have unfilled volunteer requirements. Get a birds-eye view of recent and upcoming system requirements and activity. View the status and history of each job, shift, and position, including a list of volunteers who have helped in similar spots in the past. Tabulated summaries of system activity and volunteer performance over the last week, month, or year. 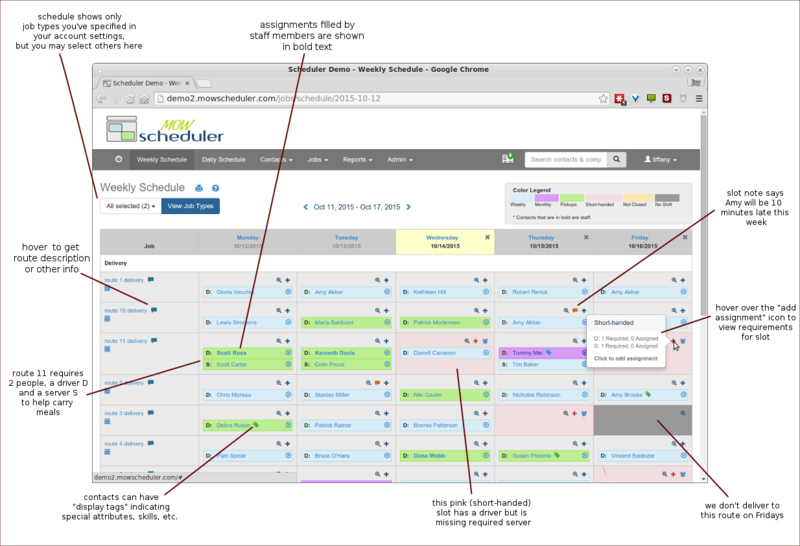 You can get a pretty good idea of how the Scheduler works by looking at a few of the key screens. You'll find that although there's a lot of information available, it all Just Works ™. Jobs vs Days for the specified week... This is the "nerve center" of the scheduler system. We've labeled some of the points of interest. Contact info, volunteer work history, current assignments, and lots more. Volunteers may view and sign up for slots that are available in the upcoming days and weeks. ...a web applications company with a 20 year history of developing collaboration and business process applications for commercial, government, and nonprofit organizations. Purplewire has a passion for helping charitable nonprofit organizations realize their missions. Over the years we've been inspired by some outstanding organizations in our community, including On Point for College and Meals on Wheels of Syracuse, and we've had the opportunity to donate our time and technical skills to help their causes. In the course of working with nonprofits, we've discovered that the operational challenges they face in their efforts to achieve their mission and grow capacity are similar to those of commercial enterprises. But "business class" technology solutions are not always an ideal fit, and often are not realistically available to nonprofits due to affordability. We want to change that. Our extensive experience developing high-quality commercial solutions, along with our shared passion for the goals of charitable nonprofit organizations, enables and motivates us to offer progressive and sustainable solutions at an affordable cost. 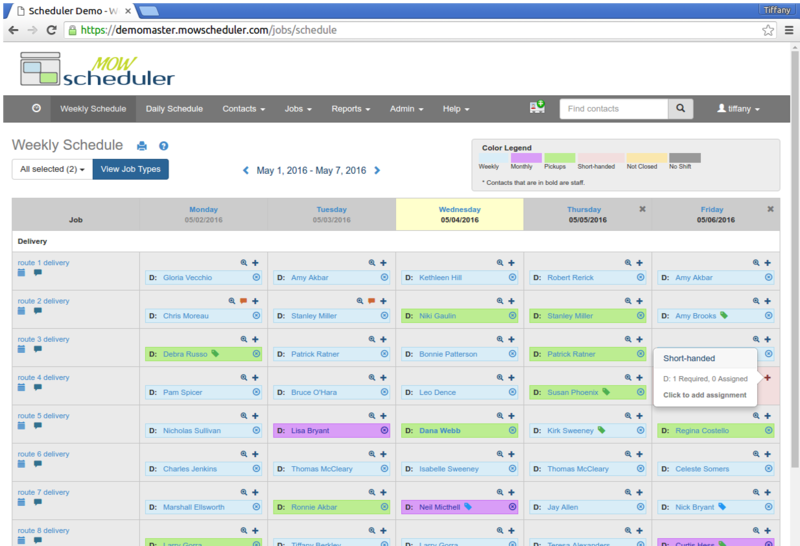 MOW Scheduler is our first initiative to combine our role as technologists with our mission to serve on a wider scale. We hope to follow with more products in the future. Includes installation of customer’s volunteer contacts, delivery routes, and ongoing assignments of drivers, riders, and food packers. Just send us you volunteer information in our import spreadsheet templates, we'll take care of the rest! Published pricing is reserved for charitable nonprofits including Meals on Wheels and similar organizations. We reserve the right to apply additional charges to other organizations and usage other than volunteer scheduling. Additional need-based discount available to charitable nonprofits. Contact us to qualify. "Since we started using the Scheduler application, juggling 40 delivery routes and kitchen jobs -- and 300 volunteers and staff -- has become much easier." "Trying to schedule 27 routes per day five days per week and substitute drivers using an Excel spreadsheet was a volunteer coordinator’s nightmare! 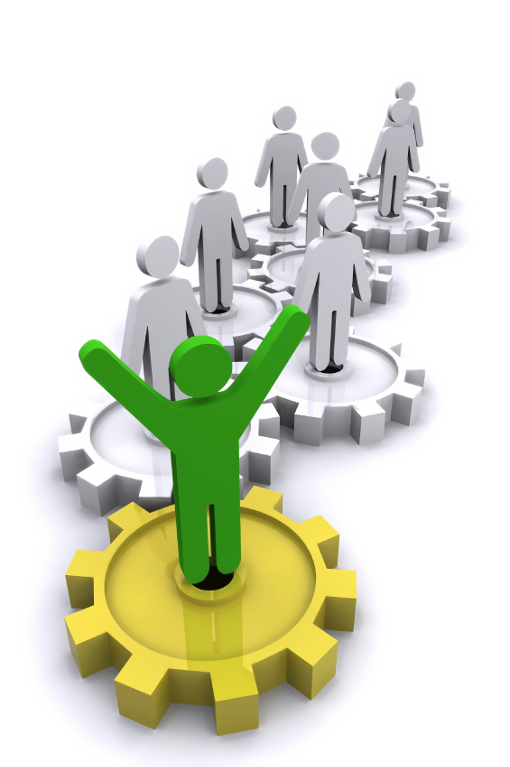 MOW Scheduler software has freed up my time to concentrate on directing expanded services and programs for our clients. I highly recommend the software." "One of the critical tasks that a home delivered meal program needs to perform is volunteer management and scheduling. Meals on Wheels of Durham has been looking for a robust and flexible solution to this problem for several years. The MOWScheduler has proven to be that tool. It has freed almost 12 hours a week of our volunteer manager's time. This allows her more time to spend on other essential tasks - such as recruitment and retention. Kudos to your team for the development of this very useful product!" "This system has been a great help to us as we increase the number of meals delivered, grow our volunteer roster, and expand our coverage area." 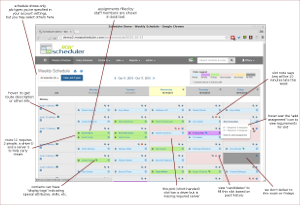 "Volunteer scheduling is a challenging technical problem; many dimensions of information must be visible at once. Working with the MOW of Syracuse really helped us shape the technology to the user needs."